When reading up on Lush's new releases for Valentine's Day, the Unicorn Horn Bubble Bar jumped out at me by a mile. I'm obsessed with trying their bubble bars at the moment and this has got to be the most stunning looking one I've seen. Shaped like a horn, the bright, swirling colours covered in silver and snowflake lustre and little stars really make it look magical. The main ingredients of Unicorn Horn are Lavender Oil, Ylang Ylang Oil and Neroli Oil, which are calming and relaxing scents. I decided to use Unicorn Horn twice and was surprised by how many bubbles just half the bar produced. The scent is primarily lavender, but it's very light and quite creamy; nowhere near as strong as the A French Kiss Bubble Bar. It's very soothing and comforting, but being subtle means it doesn't make you feel overwhelmingly sleepy or drowsy. The one thing I was disappointed about however was the fact that Unicorn Horn didn't really turn the bath water very colourful - there was an ever so slight tinge of pink but that's it. Considering the bubble bar itself is so vibrant, I was expecting this to transfer across to the bath. Unicorn Horn is a good price at £3.25, especially considering it's enough to get two uses out of. However if you're looking for a really colourful or really strong scented bath, then it may not be for you! 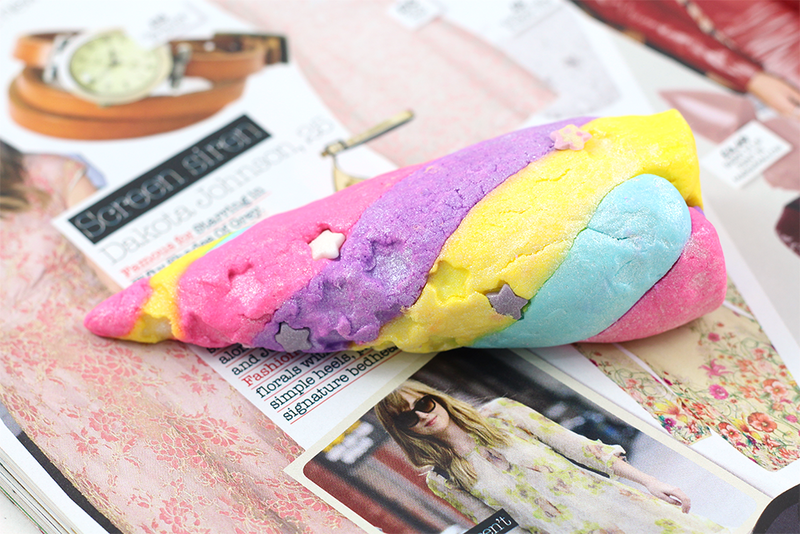 Have you tried Lush's Unicorn Horn? Is there anything else from the Valentine's Day collection you recommend trying? I wish there was a LUSH in Cabot Circus! I might trek over there on Saturday and buy one. It looks amazing! I had a quick sniff of this at my local Lush shop, unfortunately I don't like lavender scents :( Really disappointing as I love how colourful this bubble bar is! Oh I so need this in my life, I'm not really a fan of the OTT scents & colourings really. That sounds incredible! I love that it's a unicorn too, super cute!